Just planted on Washington Street, these trees came in a respectable size. As you know, trees were cut down in February along several downtown Albany streets. But some are already being replaced with new ones. In the end, this project to enhance the “streetscape” will add more trees than we had before. Redoing the sidewalks and street parking around the Albany Post Office was Phase I of the project. This week I was surprised to see newly planted trees of considerable size already in place. If the main part of the street project follows the same pattern, the loss of street trees this winter probably won’t be felt for very long. Around the post office and on Washington Street down to Water Avenue, the city specified and the contractor planted trees that sound exotic: Ruby Vase Parrotia, Styraz Japonicas Snowcones, and Persian Perrotia. The only one that sounds familiar and is easy to say: Paperbark Maple. Variety seems to have been a principle in the design. For most of the other downtown streets in the project, two of the specified species are Musashino Zelkova and Corinthian Linden. “They were selected because of their more columnar shape that won’t interfere with nearby buildings and awnings,” City Engineer Staci Belcastro told me when I asked. And where there are overhead power and telephone cables, mainly on Lyon Street from Eighth Avenue to Third, the new trees will be of the Pink Flair Cherry variety. The cherries, Belcastro explained, were chosen because they grow only about 25 feet tall. That will keep them clear of the lines. And it won’t hurt if Lyon sports “pink flair” at cherry-blossom time. 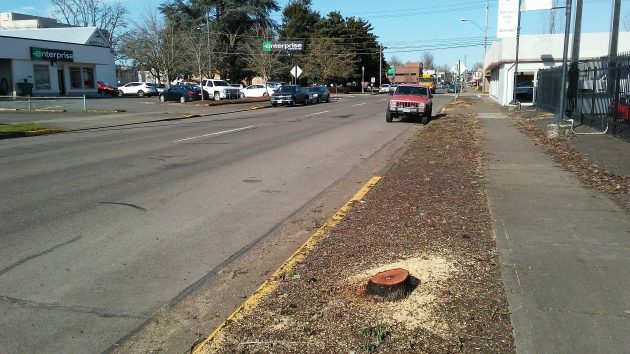 All together, the city had Buena Vista Arbor Care take down about 130 trees on downtown sidewalks. They will be replaced by roughly 225 new ones, for an average of 10 per block. The first phase of the street project around the post office has been constructed by Pacific Excavation under a contract of about $888,000. About $320,000 of that was for water line replacements covered by the water utility. The rest was funded from the overall $8.4 million authorized by CARA, the central Albany urban renewal district. Anderson’s Erosion Control, a subcontractor, did the tree planting in Phase 1. Ellsworth Street last month: The bare look won’t last all that long. CARA uses tax increment financing (TIF) which creates funding for city projects by borrowing against a future increase in property-tax revenues. 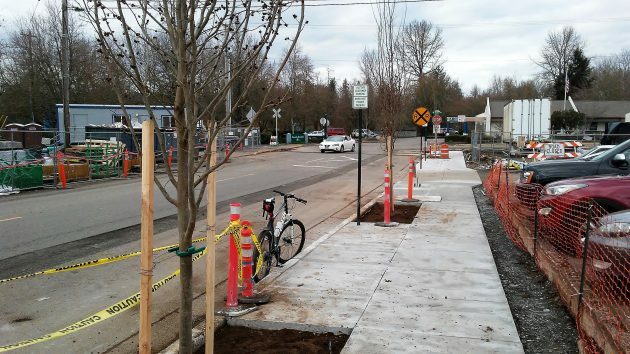 Can CARA produce any documentation that shows the expected future increase in tax revenues that will be generated by these new trees, sidewalks, and parking spaces? If CARA can’t demonstrate with numbers how much future increase this project will generate, then CARA commits fraud by using TIF. TIF becomes nothing more than a political slush fund for the city council. Who pays to water them?